Lincoln, CA— The Lincoln Potters have released details about their 2019 promotional schedule in advance of Single-Game Tickets going on sale Monday, April 1 at 10:00am. The Potters’ first season in the California Collegiate League will feature 32 home games and 13 road contests. Lincoln will play a total of 24 league games against the Healdsburg Prune Packers, San Francisco Seals, and Solano Mudcats, including 13 at home and 11 on the road. The rest of the Potters schedule is filled with top-level non-league teams from Northern California. Highlighting the non-league slate at home are games against the Fairfield Indians, Humboldt Crabs, PUF Caps, Redding Colt 45s, Sierra Wolves, Sonoma County Rebels, Team APS, Top Speed Baseball, and the West Coast Kings. Highlighting this season’s promotions are six Fireworks Nights (June 1, June 15, June 22, July 4, July 13, and July 20) including Military Night on June 1 (presented by Knee Deep Brewing Co.), Star Wars Night on June 15 (presented by Sierra Pacific), Breast Cancer Awareness Night on June 22 (presented by Friends of McBean), Independence Day Celebration on July 4 (presented by PCAR), Hispanic Heritage Night on July 13 (presented by El Portal), and Zebra Night on July 20. The Potters will again have eight premium giveaway nights, including Rally Towels on Opening Night (courtesy of Fiddyment Farms) Cool Rags on May 31 (courtesy of Astro Air Design), Manager Ryan Stevens Bobblehead on June 14 (courtesy of Feather Falls Brewing Co.), Yo-Yo Giveaway for 90’s Night on June 21 (courtesy of Marques GeneraL Engineering), Superhero Capes for Superhero Night on June 28 (courtesy of Summit Church), Reusable Grocery Totes for Food Drive Night on July 12 (courtesy of Sprouts Farmers Market), Potters Baseball Card Sets on July 19 (courtesy of De La Cruz Realty Group), and Retro Metal Lunch Boxes for Fan Appreciation Night on August 3 (courtesy of SAFE Credit Union). The free Potters Fan Fest (presented by Top Golf) will kick-off the season Memorial Weekend on Saturday, May 25 at 6:00 p.m. at Historic McBean Stadium in downtown Lincoln. The Fan Fest will include a short exhibition against the Sierra Nevada Wolves, meet and greet with the Potters’ players and coaches, autograph availability, music, food trucks, and the Kids Zone presented by El Camino Jumpers. Opening Night presented by Gladding, McBean on Thursday, May 30 will commence the Potters’ third season against the Sierra Nevada Wolves. The Potters will square off against the Healdsburg Prune Packers on Tuesday, June 4 in their first-ever California Collegiate League game. Additionally, the Potters will have six themed jersey nights including Military Night (presented by Knee Deep), Star Wars Night (presented by Sierra Pacific), Breast Cancer Awareness Night (presented by Friends of McBean), Fourth of July (presented by PCAR), Hispanic Heritage Night (presented by La Tricolor 99.9), and Zebra Night. The 2019 Potters season also features five recurring promotions, including Summerset Senior Sundays with Buy-One-Get-One free admission for all fans 55 and over (excludes July 29), additionally all active and former military receive free general admission on Sundays; Loomis Basin Brewing Co. $2 Tuesdays & Wednesdays with two dollar 12-ounce beers, soda, and water; Feather Falls Thirsty Thursdays with two dollar 12 -ounce beers, soda, and water; Stella Rosa Sangria Saturdays with $3 Sangrias. The Potters have also added two Ladies Nights where ladies 21 and over will receive free general admission on Wednesday, June 5 and Wednesday, June 19 presented by Cash & Eklund Realty Group. Additional promotions include the Spitball Gang entertainment act on June 29 (presented by Emerald Site Services) and character appearances on Star Wars Night (presented by Sierra Pacific), 90’s Night (presented by Placer Title), Superhero Night (presented by Summit Church), and Disney Night (presented by De La Cruz Realty Group). Gates will open one hour before the start of each game with Tuesday through Saturday games starting at 6:35 p.m. and Sunday games starting at 6:05 p.m. The only exception is the Wednesday, July 4 game, which will start at 6:05 p.m. The Potters are offering $1 off single-game ticket prices for groups of 10 or more. Group Nights for 25-200 fans in the VIP tented area known as The Kiln with all-you-can-eat meal plans start at $20 per person. 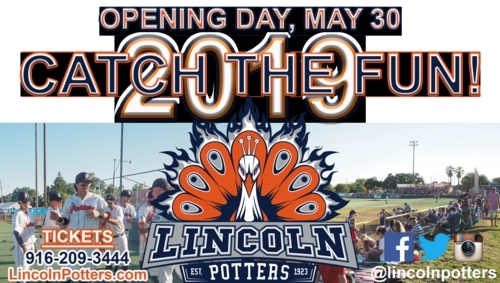 Potters single-game tickets for the 2019 32-game season at Historic McBean Stadium in downtown Lincoln will be available online at LincolnPotters.com starting at 10 a.m. on Monday, April 1. Tickets can also be purchased over the phone at 916-209-3444 or in person at the Lincoln Potters Office located at 436 Lincoln Blvd. Ste. 104. The best deal in sports is back and even better! Get 4 for $24! 4 GA Tickets, 4 Hats, and 4 McDonald’s Extra Value Meals! The McDonald’s Friends and Family Pack is available for just two games this summer so act fast and get yours today before they sell out! Season Tickets and Mini Plans are on sale now! Full-season tickets start at just $149 for General Admission and Reserved Seating starts at $249. Mini Plans and Punch Cards start as low as $25!